The lowest possible device setting for sample rate on the DL850 is 5 Sa/sec. There are however, different methods that will allow you to achieve much lower sample rates which includes the use of an external clock, decimation by the instrument, or decimation by our Xviewer software. For instructions on how to perform the EXT CLK and Decimation methods on the DL750, please refer to the attached PDF. Under the initial settings, the DL850 samples the waveform data using a clock signal produced by its internal time-base circuit. You can use an external clock (EXT CLK) signal to control sampling by applying the external clock signal to the EXT CLK IN terminal on the left panel of the DL850. One data sample is stored to the acquisition memory at every pulse in the EXT CLK signal. 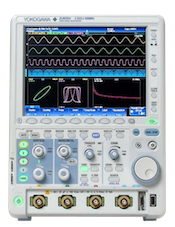 The DL850 can accept a maximum 9.5 MHZ EXT CLK signal. Keep in mind that the EXT CLK is limited by the module specification, providing a higher rate EXT CLK cannot force the module to sample at a higher rate than its maximum sample rate. For example, the 701251 module max sample rate is 1 MSa/sec; any inputted EXT CLK above 1 MHz will be ignored by the module. You can use two equations to help calculate the custom Time/Div and Sample Rates. Note: The DL850 does not display either the Sample Rate or Time/Div, but the record length will be displayed. When you control sampling using an external clock, you cannot change the time axis setting using the Time/Div knob. To change the time-axis display range, change the record length or zoom in on the time axis. Decimation is a technique used to reduce the number of samples. When saving data in ASCII format, data is decimated and converted to ASCII format before it is saved. In the DL850, decimation is called Data Removal Interval, and can be used to save a data point in specific intervals. For example, a Data Removal Interval of “Per1000” means that for every 1000 points of data in your record length, 1 data point is converted to ASCII and saved.